When Robert Skertich arrived at the temporary hospital to oversee patient care operations, he literally could see thousands of people he was assigned to serve. Between 30,000 and 50,000 Haitians, whose homes had been destroyed in the Jan. 12 earthquake, had moved onto a former golf course and set up makeshift shelters. The temporary hospital provided the vantage point above. But like all workers trained to respond to disasters, he was undaunted by the sight. Skertich, an assistant professor of public administration in Point Park's School of Business, is part of the National Disaster Medical System, which coordinates federal medical response during disasters. During late January, he led a group of 25 physicians, nurses and paramedics from the Pittsburgh area in staffing the temporary hospital in Petionville, just outside of Port-au-Prince, and providing teams to travel with the U.S. Army to help people in need of health care. Skertich says the Pennsylvania Disaster Medical Assistance Team (DMAT) was told to expect conditions not seen outside of a war zone, and the description proved accurate. As the team commander overseeing patient care operations, Skertich was in charge of supervising the medical professionals, making staffing decisions and solving problems that arose. His Pennsylvania team joined with a Florida DMAT to treat more than 3,000 patients and see many times that number. The team also provided follow-up and family health care - including deliveries - in addition to providing critical care. "Some people still hadn't been seen by a medical professional," weeks after the earthquake, says Skertich. In addition to manning the hospital, the medical staff went out on foot and in vehicles "as long as there was daylight," to seek out those in need, he said. Despite the difficulty of the assignment and language barriers, Skertich says the group fulfilled its mission. As an expert in public safety and emergency management, he wouldn't hesitate to take on a similar assignment. "It's what I do," he explains. Skertich's extensive background in public and non-profit administration includes serving as chief operation officer and emergency services director of the American Red Cross southwestern Pennsylvania chapter, a role that required him to travel to disasters nationwide coordinating mass care issues and taking on other leadership roles. Skertich's specialty is socio-technical awareness -- "how information gets from one person to another" -- and the effective use of technology in disaster situations. He continues this research through the Center for Disaster Management at the University of Pittsburgh, in addition to serving as a DMAT deputy commander and teaching public administration courses at the School of Business. 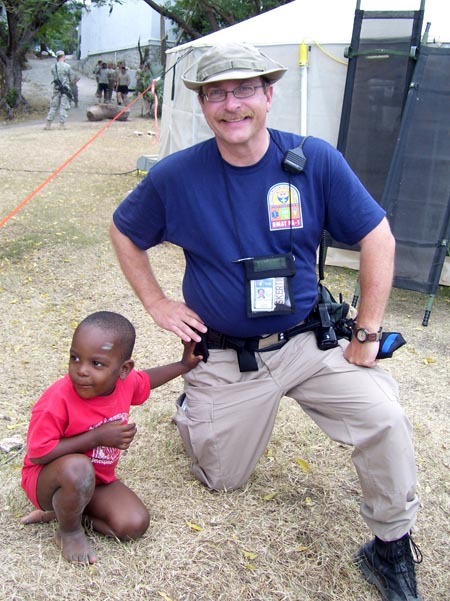 Students in Skertich's Intro to Public Administration class will get the chance to hear about his experiences leading the mission in Haiti and personal reflections about arriving only 10 days after the 7.0-magnitude earthquake.